Yup, I've been hitting the bottle lately, which is another way of saying, my mild interest in glass bottles appears suddenly to have blossomed into a full-fledged love affair. It all began when Greece forced everyone in Athens and Thessaloniki to convert to natural gas for heating and hot water. This necessitated two rows of copper pipes to be installed a few inches above my kitchen cabinets in Thessaloniki. Some years earlier, diggging through the kitchen cabinets, I had found an antique milk bottle, which I had saved and stuck up there on top of the cabinets, and this gave me the idea of hiding the ugly pipes with more bottles. So I began bringing home colorful ones, or ones with pretty shapes, and in a couple of years, I had to begin weeding out the less attracttive to make room for the more attractive. 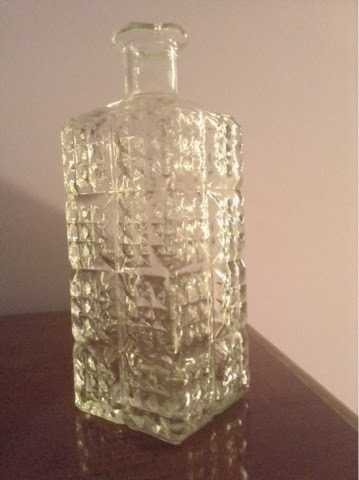 So a week ago, I went to the Goodwill store to see what I could find there, and sure enough, I found this glass bottle for $2.25. 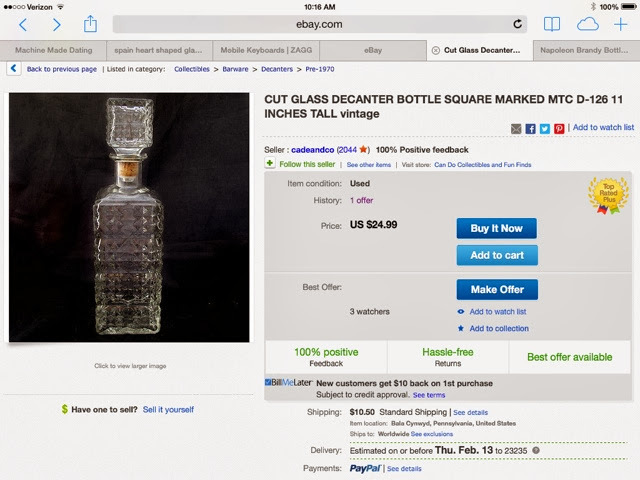 Demetrios said he didn't like it, and especially didn't like it when I read him the curious phrase embossed on the bottom: “FEDERAL LAW FORBIDS SALE OR RE-USE OF THIS BOTTLE”. We were evidently breaking the law, he said. It's a deccanter! It's made precisely to be used over and over. So what was this all about? So I poked around the internet and found out this label was required on all U.S. liquor bottles after Prohibition ended. It was meant to keep moonshiners from using them. The law was in force between 1935 and 1964. WOW, I thought. My bottle is at least 50 years old; who knew? I wonder if I can date it any more accurately? So I re-examind the bottom of the bottle andd found this mark. Any chance this meant anything to somebody out there? Oh, yes! I was astonished to learn that there are people who dedicate their lives to the subject of old glass, and tomes have been written just on the sub-topic of manufacturers' marks. 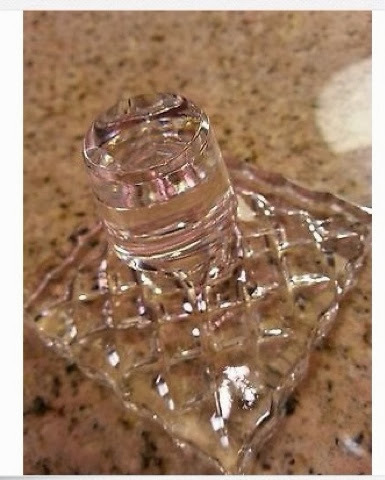 I began appreciating my bottle consderably more. 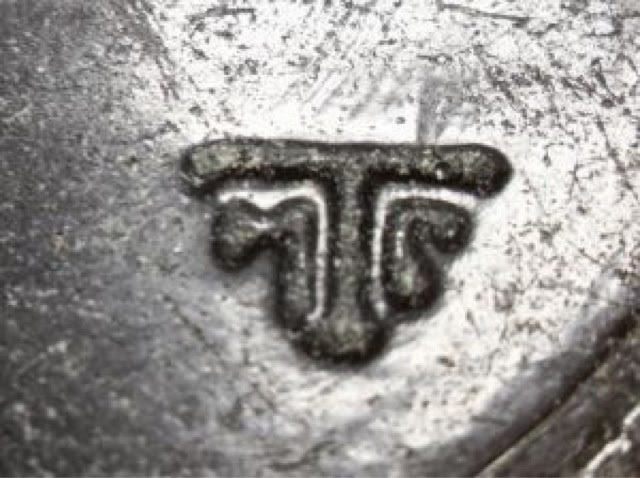 So this is a mark used by the Thatcher Glass Manufacturing Company beginning in 1944. Together with the federal inscription, that narrrowed my bottle's date to the 20 years between 1944 and 1964. 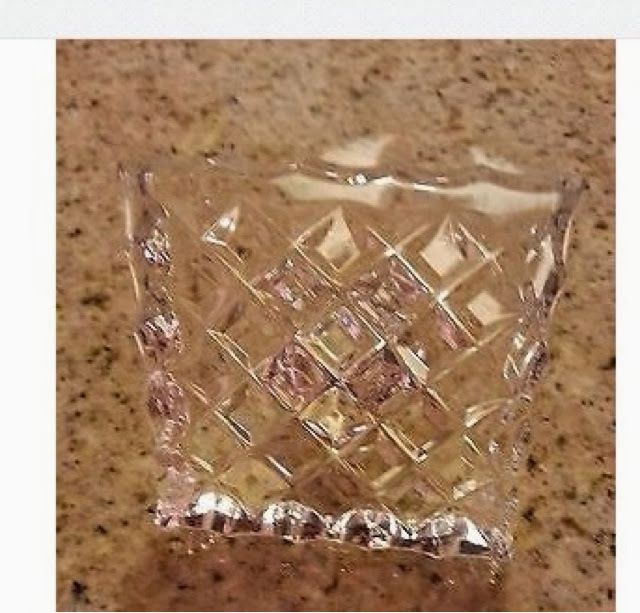 Armed with this information, I went to ebay to see whether I could discover anything about my bottle's value, and found this. I couldn't find the right stopper for sale, would have been a miracle if I could have, but I bought this one anyway, just for the looks; not being the original, it won't add any value. I think it will look as if it belonged to the decanter. All in all, I thought, very satisfactory. But then I began wondering about some of the other decorated bottles I have picked up for pennies. So far, I've found that three of them are worth about $30 each. Still trying to unearth more info about them, just for the interest. My copper pipes have long since been enclosed in sheetrock, but the bottles? I'm hooked! Perhaps I can entice you to come visit us by telling you the St. Mark's hosts the local bottle club once a month.